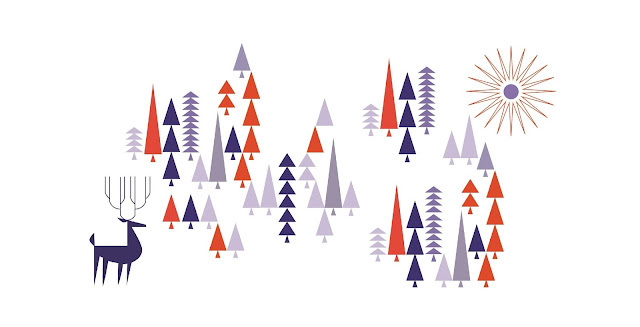 Best Wishes for a Wonderful Holiday and a New Year filled with Peace and Happiness. Many thanks to BrickUnderground for featuring us in yesterday's article about affordability and $650,000 price points across NYC. 242 South 1st Street is just a block away from the Grand Street Shopping District (home of the upcoming Whole Foods and Apple store), and several more blocks from the Bedford Avenue strip and L train. The Marcy Avenue J, M, Z is also just short walk away. Truly a superb opportunity to explore and experience Williamsburg's hottest venues, restaurants, bars, shopping and nightlife at your fingertips! Check out our listing and the rest of the article in the following link! Jeff has lived at 125 N 10 for nearly 5 years now and has had great success at both selling and renting. He takes great pride in presenting the building and what it has to offer. He just sold this triple mint, bright, south facing, ground floor, 1-bedroom, 1-bathroom residence in your building. In today’s complex real estate market, it is imperative to work with an expert who understands the unique process of selling in your specific building and neighborhood. Jeff offers a tailored marketing strategy with maximum exposure, insightful valuation and a keen focus on bringing the transaction to SOLD. 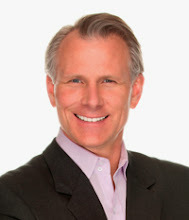 If you are considering selling your home or buying in Brooklyn or Manhattan, call Jeff. He meets the challenge! 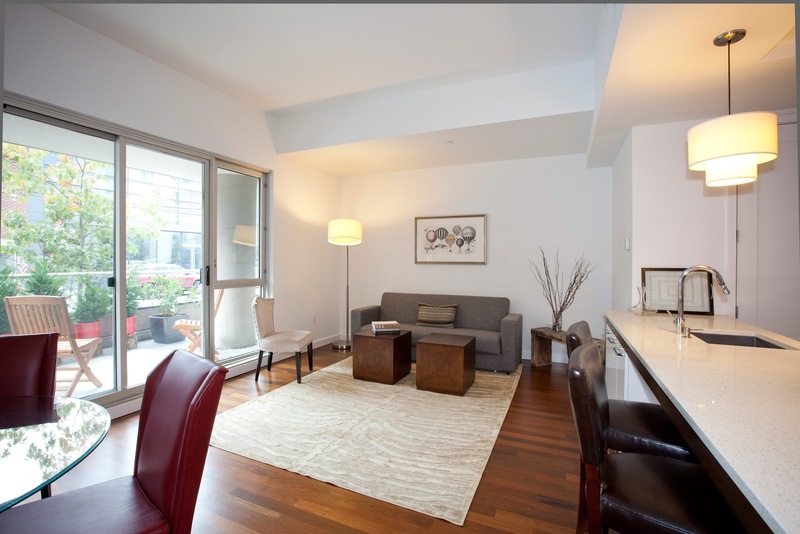 We recently placed a 1 bedroom under contract for sale. With a minor renovation, tremendous exposure and a tailored marketing strategy, we achieved top dollar for the sellers. After owning the apartment for only 2 years, the sellers made an impressive return on their investment. This is our second successful transaction in the building this year. Bel Canto is a full service, luxury, high-rise condo building providing 24-hour doorman, onsite superintendent, and a central laundry room on the lower level. All of the hallways and lobby have been recently renovated with tasteful and high end finishes, creating a boutique look and feel with only 3 apartments per floor. 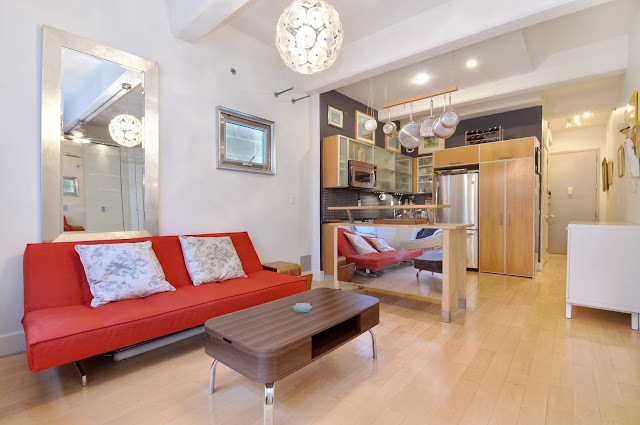 Conveniently located between Central and Riverside Parks, the apartment is only minutes from Lincoln Center, Julliard, Fordham University, and Columbus Circle and offers easy access to the 1/2/3 and A/B/C/D subway and several bus lines. 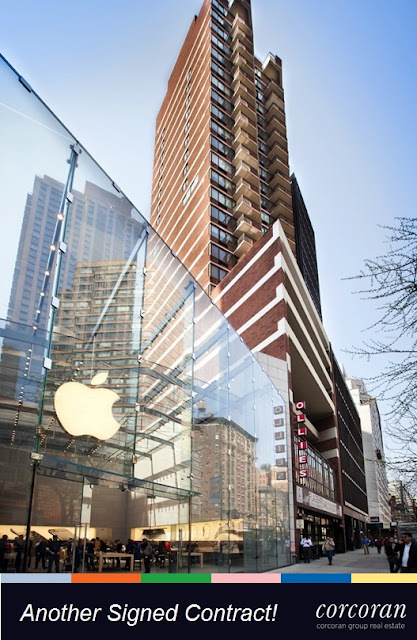 Superb location by the Apple Store and Loews movie theater, and near to Trader Joe's, Whole Foods, Fairway, farmers market, and the Upper West Side's best restaurants, shopping, gyms, and cultural activities. Pets, Guarantors, Co-purchases, Investors, and Pied-a-terres: all are permitted. The New York City Council is proposing to eliminate property taxes for the city’s 1,271 limited-income co-ops in exchange for tighter rules, an effort designed to preserve an unusual affordable-housing resource in the city. Many of the co-ops were created in the 1980s and 1990s to boost home ownership among the poor. People living in city-owned buildings were able to buy apartments for $250 each. The new proposal is designed to address two issues that have emerged in recent years: Some distressed buildings aren’t paying their property taxes and water bills; and some successful buildings, though designated as limited-income co-ops, have sold apartments for high prices. Some have gone for more than $1 million. A 14-member City Council task force on affordable housing, including Speaker Melissa Mark-Viverito, proposed the changes in a letter this month to Vicki Been, head of the city’s Housing Preservation and Development Department. The cost of the City Council proposal isn’t yet clear. The city’s Independent Budget Office is studying the issue. In the fiscal year ending in June 2014, the city billed a group of about 1,000 limited-income co-ops $21.1 million in property taxes, but collected only $14.1 million, according to data from the budget office. The new abatement proposals don’t address tax arrears. “The members of this task force are concerned about alarming developments that may risk the longevity of the program and the preservation of these affordable units,” the letter noted.The limited-income apartment buildings, which are known as Housing Development Fund Corp., or HDFC, co-ops, were created over decades under state law. Many have operated with limited or no city oversight. Most received partial property-tax abatements when they were set up, but the tax bills automatically increased year by year. 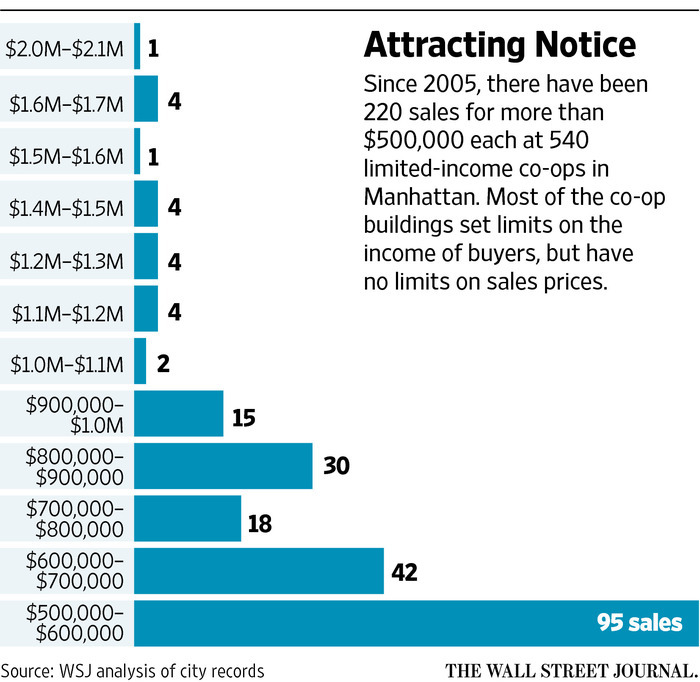 The proposed rules would offer full tax abatements only to co-ops that sign tougher agreements on how the buildings are operated. Strict limits would be set on both the income of buyers and the price at which units could be sold. The rules would also require co-ops to hire outside managers. In a statement, the city’s housing-preservation department said it has been working with housing-advocacy groups to create more oversight of the buildings, “the vast majority of which are currently unregulated.” But it didn’t specifically endorse a full tax abatement. The city agrees with the view that “we need both carrots and sticks to ensure the long-term financial viability of this critical housing stock,” the statement noted. The HDFC co-ops, especially in expensive Manhattan neighborhoods, have long been known in the brokerage community as a source of inexpensive housing for young people with limited or no income, but with financial help from parents. 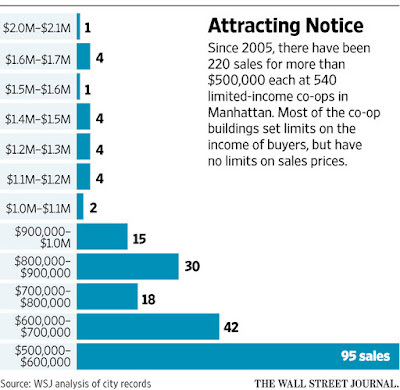 A review by The Wall Street Journal of sales at 540 limited-income co-ops in Manhattan since 2005 found 220 sales for more than $500,000 each, including 20 sales for more than $1 million. The priciest was the $2.025 million sale of a three-bedroom apartment last year at the Grinnell, a century-old Renaissance Revival building at Riverside Drive and West 157th Street. The limited-income building has no regulatory agreement with the city, as some others do, city officials say. It uses a different interpretation of state law than the city does in determining income limits for buyers. Several board members didn’t respond to a request for comment. Councilman Antonio Reynoso, said that as housing prices rose in Williamsburg, in his district, limited-income co-op owners began selling co-ops at high prices there too, in violation of city and state rules. Andy Reicher, executive director of the Urban Homesteading Assistance Board, which works with low-income co-ops, said the cost of a full tax abatement for the preservation of a co-op apartment would be a fraction of the cost to create an affordable unit under the 421-a tax-abatement program for developers. It is unclear whether the tax abatements would go far enough to help many very troubled HDFC’s, nearly a third of which have at least some property-tax arrears. At 501 W. 143rd St., a large group of shareholders struggled for years to oust a managing agent and a three-member board that had run up more than $3.2 million in tax arrears, water bills and other city charges, and had failed to provide annual financial statements. In July, the new group got control of the building and has been fending off a city foreclosure because of the tax bills owed. They are trying to persuade the city and elected officials to give them a second chance. Ronaldo Kiel, the new board president, said more rules may not always be the answer. He said the city already had authority under his building’s bylaws to conduct an audit in response to complaints but hadn’t intervened. An audit could have “prevented all this,” he said.